The FLIR-100-A is designed for field of view illumination and target designation when using night vision devices and night sights under low illumination conditions and complete darkness. Max optical output power is 100mW (factory set to a fixed value between 5mW to 100mW). Laser beam divergence is being adjusted within wide range with fixed intermediate values. Illumination spot size at a distance of 100m is 8m at the maximum beam divergence, at minimum beam divergence beam spot size is less than 100mm which enables to use FLIR-100-A as laser sight and illuminator. 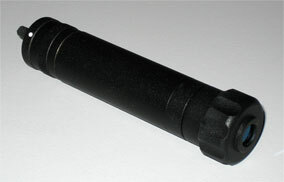 Small size and rugged shock-resistant design enable to mount the FLIR-100-A on small arms. Air-tight, dust- and moist-proof design allows using the device under any atmospheric conditions within wide temperature range.